Scene from Romeo and Juliet, at the Haymarket Theatre. "ROMEO AND JULIET" AT THE HAYMARKET THEATRE. 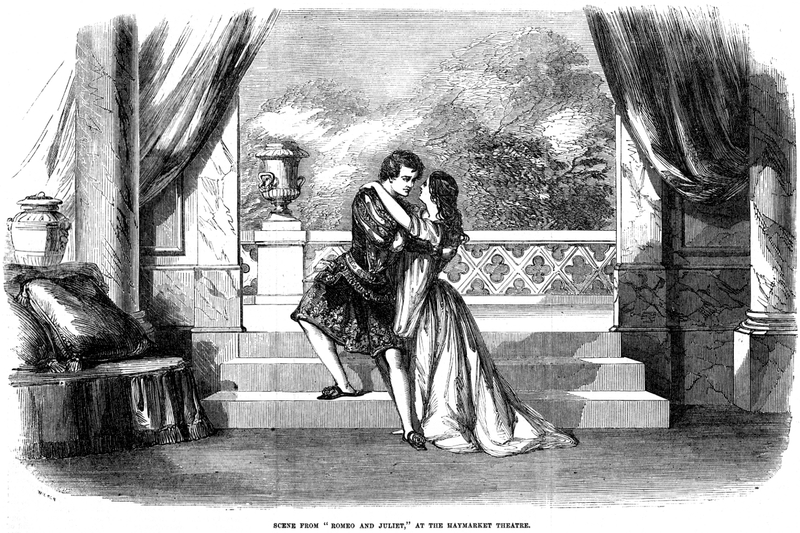 The performance of Romeo by Miss Cushman is one that possesses peculiar characteristics and in them corresponding advantages. For force and passion, it exceeds that of any male performer and yet avoids exaggeration; because the utmost vehemence of action that an actress of taste can throw into the situations is necessarily less robust than that of an actor. The latter must modify and suppress: Miss Cushman is enabled to expand and display the signs of emotion. One of the most affecting scenes in this, the greatest love-play in the world, is the parting one between the lovers. The necessity of the step overcomes all scruples, but that necessity is better made out in Arthur Brooke's poem than in Shakspeare's [sic] tragedy. This scene, which has been more than once pictorially illustrated, derives new interest from the successful début of a new Juliet. Miss Swanborough, though deficient in physical force, has much feeling and grace, and when she becomes more fully acquainted with the requirements of the stage in general, and of this highly impassioned character in particular, she will doubtless make a good actress. It has been justly said by histrionic professors that no actress, however talented, can know how Juliet should be performed until she is too old to impersonate the part. We should recollect and make allowance for the difficultly that this authority implies in judging of the claims of a new actress in Shakspeare's [sic] great love-heroine.